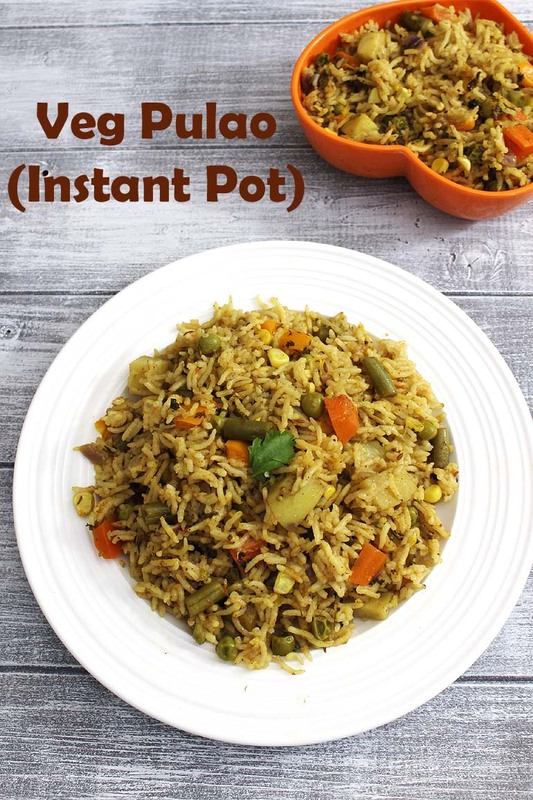 Instant Pot Veg Pulao Recipe – healthy rice dish made quickly in the IP. This makes quick weeknight meal or pack into lunch box. This vegetable pulao is Vegan and Gluten free. Any kind of pulao dish (especially this IP veg pulao) is our favorite meal. While pressure is building and cooking, I quickly whip up the raita and roast the urad papad to go with it. This way the dinner or meal is ready in only 25-30 minutes (from start to finish). When you order a rice dish in Indian restaurants, the rice grains are separated and texture is slightly under-cooked (al dente). But at home I prefer completely cooked, soft rice (not mushy) just because of easy digestion. With this recipe, you will get soft, fluffy rice grains still they are not clumped up together but separated from each other. This vegetable pulao is aromatic because whole spices and garam masala are added. If you do not have whole spices in your pantry, no worries. Instead use ready made pulao or biryani masala. If so skip garam masala in the recipe. The rice to water ratio usually 1:2 when cooking on stove top. But for IP, the ratio should be 1:1. In short, for 1 cup of rice, you will need 1 cup of water. Also the veggies will leave their own water while cooking. After adding washed rice, saute or roast for 1-2 minutes. This helps to firm up the rice grains. So they do not break, mush easily once they are cooked. Also, after opening the IP lid, let the cooked pulao rest for 5 minutes. By this time cooked rice grains get some time to firm up. So they does not break or mush as you stir. I like lots of vegetables in my pulao, if you like less then decrease the total veggies quantity. Here I have used green beans, green peas, carrot, sweet corn, potato and capsicum. You can use your choice of veggies, few other options are cauliflower, broccoli, asparagus, mushrooms, snow peas, sweet potato (yam) etc. To avoid chopping of vegetables, you can use frozen pack of mixed vegetables. 1) First take ginger, garlic, green chili into the blender jar. 2) Pulse it to make coarse paste. Remove it and keep it aside. 3) In the same blender, add chopped tomato. 4) Blitz it till you get smooth tomato puree. 5) Also prep all the veggies. 6) Start with saute mode in IP. Once hot add oil and cumin seeds. Let the seeds sizzle a bit and they get light brown in color. Now add whole spices (peppercorns, cloves, cinnamon, green cardamoms, black cardamom, bay leaf), saute for 30-40 seconds. You will notice nice aroma of the spices. 7) Now add onion and prepared ginger, garlic, green chili paste. 8) Mix and cook for 2 minutes or till onions get soft and translucent or light pink in color. 9) Now add pureed tomato and mix. 10) Cook for 2-3 minutes or till it thickens a bit. Meantime wash the rice under running cold water till water runs clear or rinse them 2-3 times. 11) Next add all the vegetables, chopped mint and coriander leaves. 13) Add salt, turmeric powder, garam masala and kasoori methi. 14) Mix and saute for a minute. 15) Add washed rice, mix and saute for a minute. 17) Also add lemon juice and stir. Cover the IP with lid (vent to sealing position), cancel the saute mode. Cook on manual mode for 5 minutes. Once IP beeps, let NPR (natural pressure release) for 5 minutes then do QPR (quick pressure release) by positioning vent from sealing to venting. 18) Once pin drops, open the lid. DO NOT stir or disturb the rice, let it rest for 5 minutes. So rice gets chance to firm up and will not break as you stir. After the 5 minutes resting time, you can fluff up, gently mix and serve. Serving suggestion: Serve this Instant pot veg pulao as a meal with raita (onion tomato raita, cucumber raita, spinach raita, mint raita) or plain yogurt. Serve roasted papad and pickle on side. 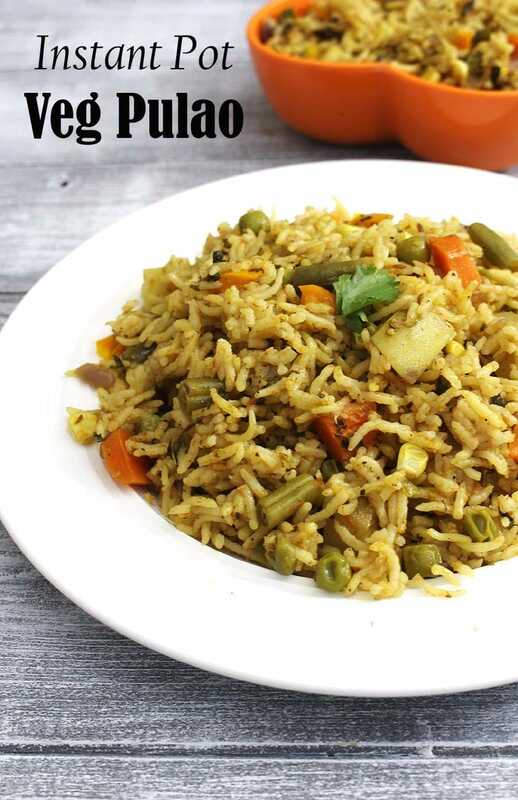 This vegetable pulao can be packed into kids or adults lunch box. Instant Pot Vegetable Pulao Recipe - This is vegan, Gluten free, healthy veg pulao made in IP. Prepare the coarse paste of ginger, garlic and green chili in the blender using pulse button. Remove and keep it aside. In the same jar, make puree of tomatoes. Keep it aside. Also chop the veggies and keep them ready. Wash the rice under running water or rinse them. If you want you can soak them for 5-10 minutes, this is optional. Start the IP with saute mode. Once hot add oil, cumin seeds and whole spices. Saute for a minute or till spices are fragrant. Mix in chopped onions and prepared ginger, garlic, green chili paste. Cook for couple of minutes or till onions are soft. Mix in tomato puree and cook till it thickens slightly. Add all the veggies, cilantro, mint leaves, salt, spice powders (turmeric powder, garam masala, kasoori methi). Mix and cook for a minute. Mix in washed rice saute for couple of minutes. Then add water and lemon juice. Cook on manual for 5 minutes then NPR for 5 minutes and do QPR. Once you open the lid, let the pulao rest for 5-10 minutes, after that fluff up, mix and serve.